What a pretty set for your kitchen! A very different look for your kitchen cookware and very suitable for cooking as well as serving your family at the dinner table. 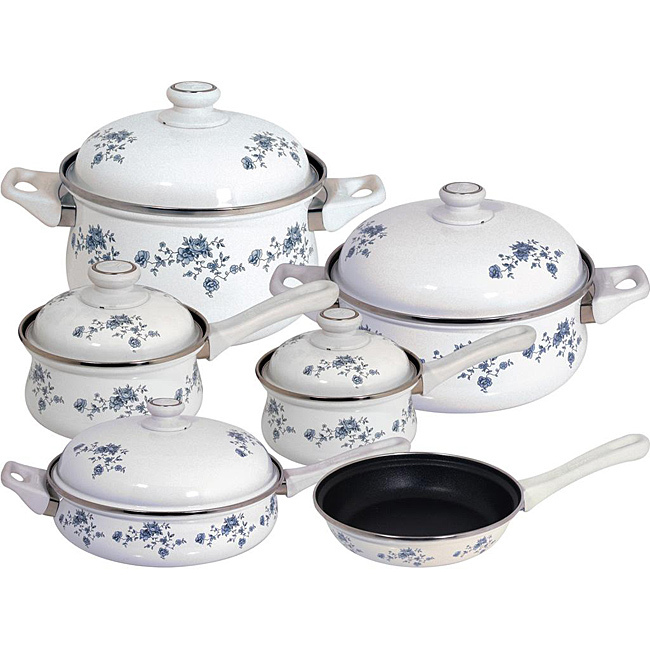 Prepare your favorite recipes in this Magefesa 11-Piece Blue Garland Enamel on Steel Cookware Set. Made from stainless steel with a surface coating of enamel, it will perform well for you. Try delicious stews, pasta, soup, vegetables, and hot fruits in any of these cooking pans. Enamel coated stainless Provides durable kitchen cooking pans and casserole dishes that are suitable for range top or oven cooking. Attractive floral design Offers suitable cookware for casual or more elegant dining. Withstands very high heat That makes this pot and pan set suitable for a wide variety of recipes. Dishwasher safe Makes clean up quick and easy. Long white handles Are easy grip and cool to the touch. Stainless steel rims Offer an attractive, finished edge to pots and pans.